Today is the last day of the Twelve Days of Christmas and this is the last verse of my rendition of the Twelve Days of a Green Christmas, so take a deep breath before you sing all the verses…On the twelfth day of Christmas my green friend gave to me…12 recycled glasses, 11 soy candles, 10 native plants, 9 organic wines, 8 backyard hens, 7 CFLs, 6 fair-trade chocolates, 5 faucet aerators, 4 solar lights, 3 large rain-barrels, 2 new thermostats and a live…Christmas tree! I have long been intrigued with the beauty of recycled glassware for years. With more emphasis on recycling over the past decade many businesses have taken the opportunity to market goods made from recycled “waste”. Not only are consumers able to purchase unusual objects they are also helping to keep our landfills from becoming the largest and most numerous “mountains” around us. You might wonder “Can I recycle my old glassware so I can buy glasses made from recycled glass?” That’s a great question that I wondered about but didn’t know the answer until I researched recycled glassware for today’s twelfth day of a Green Christmas. The glassware most of us have in our cabinets was made from a “tougher” glass which means it contains added chemicals to make the glass tougher and more resistant to breakage. 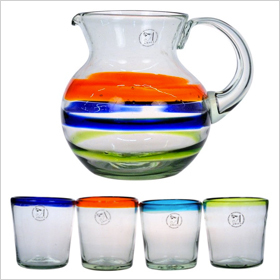 These chemicals require a different melting point for the drinking glasses and other glass dishes like Pyrex which do not allow them to be melted with glass bottles. As far as the chemicals used to make drinking glasses, the chemicals primarily used are Silica (SiO2). sodium oxide (Na2O) and lime (CaO). Whether any of these chemicals add any toxins to our bodies I could not find the answer. You’re best bet for recycling your old glassware is a friend or charity so someone else can use them, but if you break a glass be sure to safely dispose of it with your regular garbage. If you are reading this last paragraph of my Twelve Days of a Green Christmas, congratulations for making it through all twelve days! I learned a lot researching the topics for each day and I hope you were able to learn something new as well. If you have another moment I would really appreciate some feedback on these posts. Either make comments below or select one of the answers in the poll above the comment section. I very much enjoyed your Twelve days of Green Christmas; I found it to be educational, informative and downright entertaining. Thank you Gary for reading my posts! I was worried 12 days of posts would be too much. I had a lot of fun coming up with the twelve gifts and researching each topic. I certainly increased my knowledge from this “venture” and hope to do it again next year.